Post Two of my Shu Uemura themed week, in which I review some of Shu's iconic products. The second post is a very different opinion to that which was posted yesterday (by my pal @MontyC) of the Shu Uemura Cleansing Oil. Please see here for her impressions, and read on to see what I think! and more lately, also the orange one (or their latest, greatest, fancier and slightly more expensive Ultime8 cleanser). 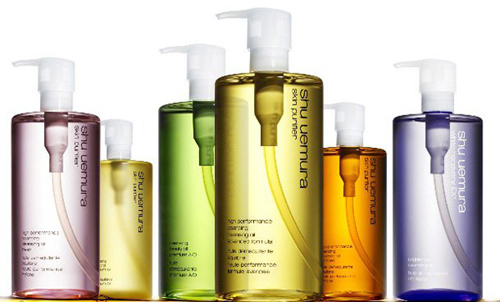 Before we continue, you can find more information on all of the Shu Uemura cleansers on their website here. I purchase them from Brown Thomas Dublin. There's pretty much supposed to be a cleanser for every skin type, but I do find that they are all quite heavily scented; natural smells sure, but strong enough for all that, which may or may not suit. So you've likely read my friend's post - she used this and it didn't work for her at all, in fact she was quite disappointed with it. I have had completely the opposite experience, I have to say! I don't use this in the morning, I use it in the evening as a makeup remover. I use about four-to-five pumps of this, spend about two-to-three minutes massaging it in, then I use a tiny bit of warm water to emulsify this*, turning it into a milky liquid on my face, then use a facecloth to remove. I am an Experimental Makeup Person. I view makeup as theatre, as art, as self expression, as part of my outfit for the day (it's not uncommon for me to plan my face, then handbag, then hair, then shoes, then finally clothes). I have a very early start each day, and the night before I plan my makeup, and lay it all out in order to help speed up application in the morning). I rarely am seen out without a full face (except on Makeup Free Sundays, to give my skin a break!) I am always trying out a new product, a new look, a variation on a technique, for fun as well as for practice. And I wear a lot of eye makeup. I don't do a "natural eye look" very often - I love smokey eyes, I love eyeliner, I love lots of mascara in particular. All of this needs a decent cleanser to remove this stuff at the end of the day. Personally, I find that this, either of these in fact, removes about 90-95% of my makeup. Maybe 100% on those days when I don't wear as much. Maybe 80% on the days that I wear a lot of waterproof eye makeup products (at which point I will use an eye makeup remover to take the rest away). I have yet to find a makeup remover that will take absolutely everything away, but this comes pretty damn close for me, and my skin feels amazing afterwards, not heavy or greasy as you might expect when using oil to cleanse.